A cosmic krautrock glam band, beamed in from an intergalactic future. The history of fictitious bands made real consists of some solid gold, whether comedic or otherwise. There’s the Rutles, Spinal Tap, and, of course Gorillaz, four cartoon characters who’ve become a living, breathing supergroup with an ever-changing superstar cast. 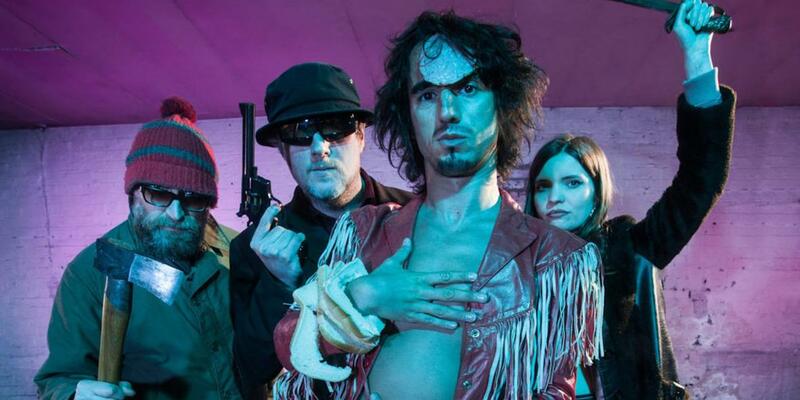 The Moonlandingz have had a similar trajectory; starting life as a fictional band in the mind of Sheffield’s Eccentronic Research Council, a concept album blurred the lines before further recruitment led to more shows and a debut album proper. Now, it seems they’re real, unleashed on an unsuspecting world ill prepared for their inventive madness. For make no mistake, the Moonlandingz have ripped up the rule book on how to lose friends and alienate people. Playing naked, wearing food as jewellery, and a general disregard for health and safety are just some of the antics on display at their wild, provocative shows. But such shock and awe is only part of their appeal; their glam-heavy synth retrofuturism is incredible catchy. It might look a little silly on paper, but the indie-disco dancefloor vibe of their music has a certain toe-tapping charm, not to mention the sheer bravado of throwing so many different elements – pop, punk, glam, soul, electro – into the mix and believing in it so whole heartedly. Who else would, in 2017, have Yoko Ono and the Human League’s Phil Oakley duet on a six-minute electro-prog song, ending it in a cacophony of feedback, guitar squalls, and screaming? There’s method in the madness, and the Moonlandingz are resolutely following their own path.